Informal essay is mainly written in a less formal statement. They are written to connect with the reader. It is not informative or persuasive. This essay aims at being more personal in nature than being formal. The writer has to be informal in tone and build a conversation with the reader. It defines the personality traits of the writer. Although this essay allows you to express your personal views that doesn’t mean you can continue writing a long essay repeating the same things. Informal essays are said to be less informative and convincing. But this isn’t the full truth. It helps you express your thoughts in an informal tone while maintaining the idea of speaking on a relevant topic and providing the relevant information. They are informative but are meant to mainly communicate to the readers about some common problem or happening. When you write in an informal tone, the reader connects to your essay in a much better manner. Students are given informal essay writing assignments to test their ability to express their independent views and opinions freely on a given topic or issue. It helps to evaluate the distinctive features of the student. While writing an informal essay you have to be cautious about not using slang language or overdoing the informal context. 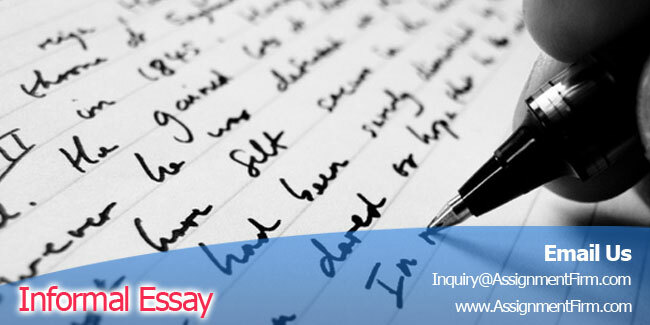 Your idea and motivation of writing the informal essay need to be maintained throughout. Therefore, an informal essay cannot have a fixed format. It completely depends on the personal writing style and preference of the student writing it. Structure and Style of an informal essay have no restriction on the length part unlike other types of Essay Writing. The tone of the informal essay includes words like “I” or “We”. The usage of everyday words is more. The writer expresses a very relaxed tone which is similar to the way one speaks to another in messages. Write an Informal essay keeping the reader audience in mind. You will be able to convey your message and views to the target reader only when you know them well. Therefore while writing an informal essay maintain a uniform concept and express your ideas precisely.